MIAMI — Britvic, one of the leading soft drinks companies in Europe, today announces the launch of a Robinsons Fruit Shoot No Added Sugar flavor, Strawbrainy, a new flavor developed exclusively for the U.S. market. The global kids’ brand introduces the flavor with playfully spooky, kid-friendly limited-edition packaging, along with themed activities on the brand’s Facebook page, to fuel kids’ imaginations for the Halloween season. Robinsons Fruit Shoot is available in both No Added Sugar and Regular varieties and is made with real fruit juice and contains no high fructose corn syrup. 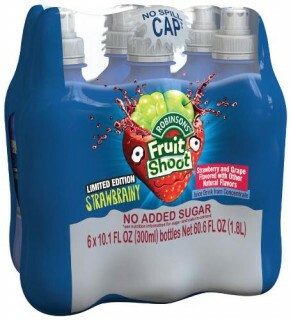 Fruit Shoot drinks are packaged in colorful bottles with a convenient re-sealable sports cap to ensure easy drinking on-the-go. The new No Added Sugar Strawbrainy flavor features strawberry, grape and apple juices and is low in calories, with 15 calories per bottle. The new flavor will be available in single-serve and six-packs of 10.1 fl oz bottles and has a suggested retail price of $.99 per bottle and $3.99 per six-pack. For the upcoming Halloween holiday, Fruit Shoot is featuring fun activities for moms and kids on the brand’s Facebook page and on their website,www.fruitshootusa.com. On both websites, kids can meet the Strawbrainy character and see teasers and videos about his spooky adventures. Coupons will also be available to print via the Facebook page, with an offer for consumers who buy three bottles of single-serve Fruit Shoot to receive one free bottle. Britvic introduced Robinsons Fruit Shoot to the U.S. market in 2008 and continues to pursue growth for its brand portfolio in the U.S. through distribution partnerships with PepsiCo. Fruit Shoot is widely distributed in Walmart, Family Dollar and 7-Eleven, amongst other grocery and convenience stores. Britvic is one of the leading branded soft drinks businesses in Europe. The company leverages its own leading brand portfolio including Robinsons, Tango, Drench, J2O and Fruit Shoot as well as PepsiCo brands such as Pepsi, 7UP and Mountain Dew which Britvic produces and sells in Great Britain (“GB”) and Ireland under exclusive PepsiCo agreements. Britvic is the largest supplier of branded still soft drinks in GB and the number two supplier of branded carbonated soft drinks in GB. Britvic is an industry leader in Ireland with brands such as MiWadi and Ballygowan, and in Francewith brands such as Teisseire and Moulin de Valdonne. Britvic is growing its reach into other territories through export, licensing and franchising arrangements. Britvic is listed on the London Stock Exchange under the code BVIC.